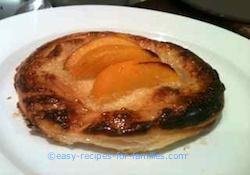 This peach tart recipe is very easy to make, looks fantastic and tastes delicious! Make several and have them available as snacks. This recipe makes 12 tarts. Serve as is, or with ice cream or whipped cream. 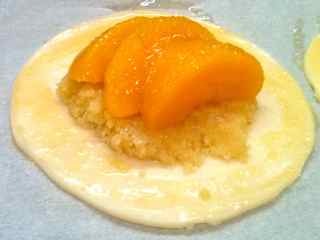 •	Prepare Almond Filling - Melt butter in a sauce pan. Take it off the heat as soon as it's melted. Add all the almond meal and sugar. Combine well. This peach tart recipe is delicious and you'll just love it. Remove the tarts from the baking paper as soon as it can be handled, as otherwise the paper tends to stick to the base of the tart. Easy Tiramisu Recipe - looks elegant, tastes divine! Easy bread pudding recipe - this bread pudding is for hungry kids and it'll fill them up after a hard day at sport. Ideal for winter. Quick Pud - a super simple golden syrup pudding.